Antique Black Cromwell Handles. Supplied in all door handle variations. The Cromwell Sprung Lever is part of the Cromwell Sprung Lever Handles range by From The Anvil. 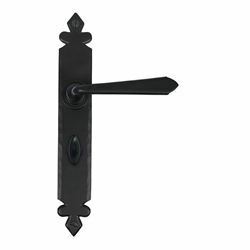 This handle has a tudor style backplate and comes with a slightly flattened, triangular shaped handle. All Cromwell handles come with a strong spring found in the backplate to give it a good feel when operated.